Check it out! 1 dress THREE WAYS! Talk about a worthy Investment! We like getting the most bang for our buck and why shouldn’t we? When it comes to buying clothes, most people think about how many different ways they can wear an outfit or a particular item of clothing. Sometimes,we feel limited when it comes to styling but all you need are a few good accessories and Polish! 🙂 Read on to see how we take one dress and make three looks from it. The possibilities are endless! Just use your imagination. Sometimes, it helps to have a “theme”, though, you would never want to look like you were going to a costume party so keep that in mind while getting dressed. Our first look was clearly inspired by the dress. How can you not associate Southern Belle with a lace eyelit dress? It’s just impossible! We added a gigantic floppy hat, a pretty belt and heels. Every grandmaw this side of the Mississippi will be trying to set you up with their grandson! It’s sure to be a winner! Our second look is a la new girl! It reminds me of the indie darlings that frequent anthropologie, drink hot tea and have record players. The girl that would wear this is everyone’s friend and refuses to take herself too seriously. We love her! 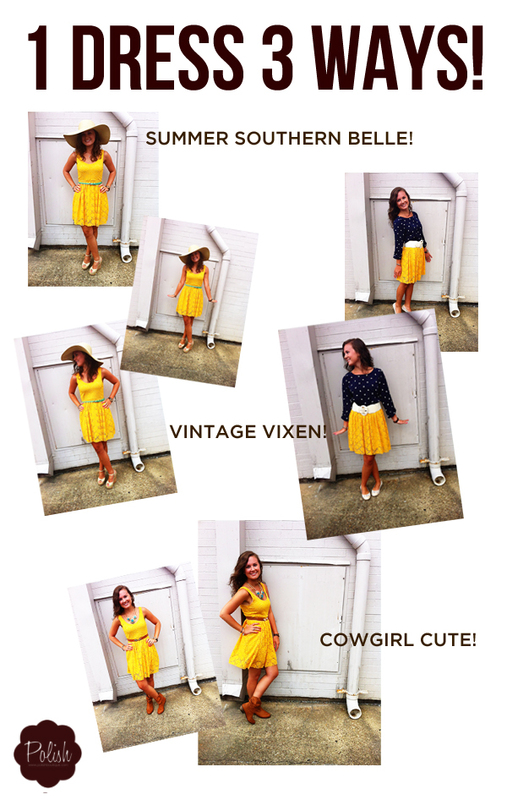 Of course the third look is for those country gal’s that love going to blue grass concerts! They often drink from red Solo cups and live on dirt roads. They aren’t afraid to get their hands dirty and always clean up real nice! Of course, The great thing about all of these outfits is that you can wear any of them regardless if you fit into that mold or not! It’s fun playing “dress up” isn’t it! ?